Whoever coined the phrase “it’s a small world” obviously never tried to travel around it! In truth, the planet’s dimensions are quite impressive, and determining just how big it is took many thousands of years. From astronomers determining that Earth was in fact round (and not a flat disc, cube or ziggurat), to the first successful attempts at circumnavigation, our estimates have changed over time. And in the era of modern astronomy, improvements in instrumentation, methodology, and the ability to see Earth from space have certainly helped. According to modern estimates, the surface area of the Earth is approximately 510 million square km (5.1 x 108 km2) or 196,900,000 square miles. Determining this was not only a matter of ascertaining Earth’s dimensions, but also its proper shape. For starters, and contrary to what scientists have believed since classical antiquity, Earth is not a perfect sphere. 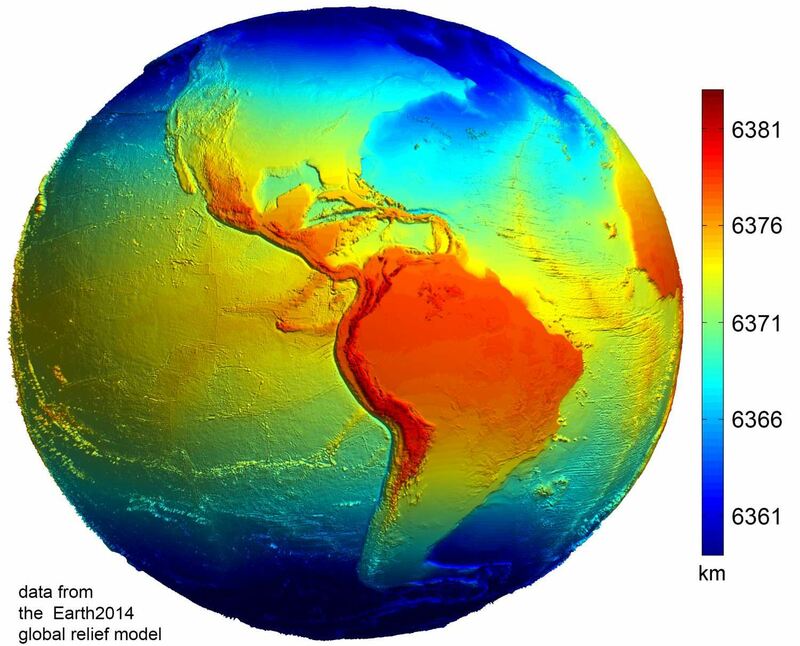 Since the 17th and 18th centuries – thanks to improvements made in the field of astronomy and geodesy (a branch of mathematics dealing with the measurement of the Earth) – scientists have understood that the Earth is actually a flattened sphere. 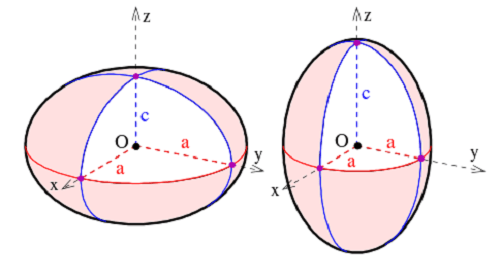 This is what is known as an “oblate spheroid”, which is a sphere that is wider at its horizontal axis than it is at its vertical axis. According to the 2004 Working Group of the International Earth Rotation and Reference Systems Service (IERS), Earth experiences a flattening of 0.0033528 at the poles. This flattening is due to Earth’s rotational velocity – a rapid 1,674.4 km/h (1,040.4 mph) – which causes the planet to bulge at the equator. Because of this, the diameter of the Earth at the equator is about 43 kilometers (27 mi) larger than the pole-to-pole diameter. The latest measurements indicate that the Earth has an equatorial diameter of 12,756 km (7926 mi), and a polar diameter of 12713.6 km (7899.86 mi). This is true for other planets in the Solar System that have rapid rotations (like Jupiter and Saturn), and even stars like the rapidly-spinning Altair. Whereas S equals the surface area, c represents the distance from the center to a pole, and a represents the semi-axis, e represents the eccentricity. Naturally, Earth’s surface area can also be subdivided between water and land segments (aka. oceans or continental crust). And since 70% of the Earth’s surface is covered by water, that works out to 361 million km² (139.4 million mi²). Earth’s continents, on the other hand, cover the remaining 149 million km² (57.5 or million mi²). This is a phenomena unique to Earth (at least in our Solar System) since no other Solar planet has liquid water covering a significant amount of its surface. Mercury is the smallest planet in our Solar System (ever since the 2006 IAU decision that designated Pluto as “dwarf planet”). It has a surface area of 7.48 x 107 km2, which is only about 15% of Earth’s surface area. Venus is similar in size to Earth, hence why it has earned the title of “Earth’s Sister Planet”. Consistently, Venus has a surface area of 4.6 x 108 km2, which is roughly 90% of Earth’s. Mars is also a small planet, the second smallest in our Solar System. This is evident in Mars’ diminutive surface area of 1.45 x 108 km2, which is roughly 28% that of Earth’s. Moving to the outer Solar System, it is quickly made apparent that all of the gas giants have the four planets of the inner Solar System beat (at least in a size contest)! Jupiter is the largest planet in our Solar System, with a surface area of 6.14 x 1010 km2 – which is about 122 times greater than the surface area of Earth! Saturn is the second largest planet in our Solar System and has a surface area of 4.27 x 1010 km2 – which is roughly 83.7 times that of Earth. As for the “ice giants”, Uranus has a surface area of 8.1156 x 109 km2 (15.91 times that of Earth) while Neptune has a slightly smaller surface area of 7.618 x 109 km2, which is close to 15 times that of Earth. All told, Earth is relatively spacious place, as terrestrial bodies go. But the amount of surface that we humans can actually live on is rather limited. Once you subtract all the space that’s occupied by water, you begin to see that the world may be a little on the smallish side after all. We have written many interest articles about the Earth for Universe Today. 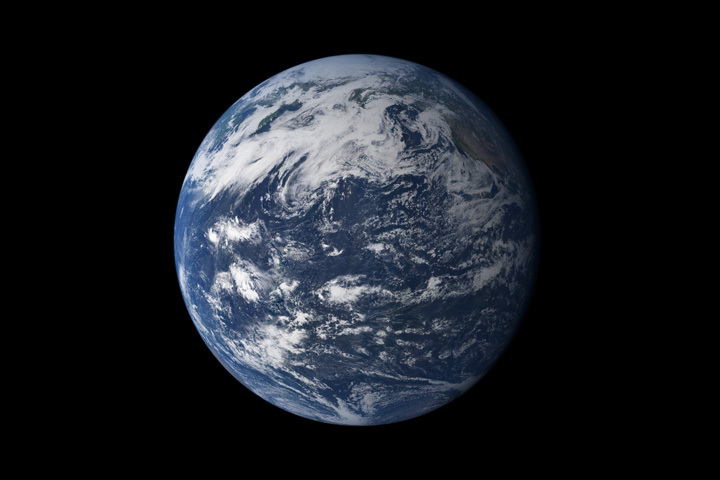 Here’s What is the Diameter of Earth?, How Strong is the Force of Gravity on Earth?, How Much Does the Earth Way?, How Fast Does the Earth Rotate?, 1o Interesting Facts About Planet Earth, What is the Earth’s Average Temperature?, and Why Does the Earth Rotate?